Researchers of Isfahan University of Technology present studies of the electronic properties of the graphene bilayers in the presence of diagonal disorder. Use of KPM method allowed for calculation of local density of states (LDOS) without digitalization of the Hamiltonian. Geometrical averaging of the LDOS's at different lattice sites as a criterion to distinguish the localized states from extended ones was employed. The conclusion is that bilayer graphene undergoes Anderson metal-insulator transition at a critical value of disorder strength. High-performance graphene field-effect transistors have been fabricated on epitaxial graphene synthesized on a two-inch SiC wafer, achieving a cutoff frequency of 100 GHz for a gate length of 240 nm. The high-frequency performance of these epitaxial graphene transistors not only shows the highest speed for any graphene devices up to date, but it also exceeds that of Si MOSFETs at the same gate length. The result confirms the high potential of graphene for advanced electronics applications, marking an important milestone for carbon electronics. We show a general two-step method to grow hydroxide and oxide nanocrystals of the iron family elements (Ni, Co, Fe) on graphene with two degrees of oxidation. Drastically different nanocrystal growth behaviors were observed on low-oxidation graphene sheets (GS) and highly oxidized graphite oxide (GO) in hydrothermal reactions. Small particles pre-coated on GS with few oxygen-containing surface groups diffused and recrystallized into single-crystalline nickel hydroxide Ni(OH)2 hexagonal nanoplates or iron oxide Fe2O3 nanorods with well defined morphologies. In contrast, particles pre-coated on GO were pinned by the high-concentration oxygen groups and defects on GO without recrystallization into well-defined shapes. Adjusting reaction temperature can be combined to further control materials grown on graphene. For materials with weak interactions with graphene, increasing the reaction temperature can lead to diffusion and recrystallization of surface species into larger crystals even on highly oxidized and defective GO. Our results suggest an interesting new approach to controlling the morphology of nanomaterials grown on graphene by tuning the surface chemistry of graphene as substrates for crystal nucleation and growth. We fabricated large area infrared photodetector devices from thin film of chemically reduced graphene oxide (RGO) sheets and studied their photoresponse as a function of laser position. We found that the photocurrent either increases, decreases or remain almost zero depending upon the position of the laser spot with respect to the electrodes. The position sensitive photoresponse is explained by Schottky barrier modulation at the RGO film-electrode interface. The time response of the photocurrent is dramatically slower than single sheet of graphene possibly due to disorder from the chemically synthesis and interconnecting sheets. We calculate the power transfer from electrons to acoustic and optical phonons in monolayer and bilayer graphene. We show that in both types of graphene, at low temperature T the power associated with acoustic phonons follows a "T^4 law" similar to that found in normal metals, but at high temperature the temperature dependences for monolayers and bilayers differ. In the crossover region we evaluate the power numerically. At very low temperatures heat dissipation by electrons is dominated by diffusion, and we estimate the crossover temperature at which acoustic phonon coupling takes over. At even higher temperatures optical phonons begin to dominate. We study in particular the in-plane optical phonon modes, but for bilayer graphene we consider also out-of-plane modes. We find that the power exchanged between electrons and in-plane optical phonons close to the charge neutrality point is of comparable magnitude in monolayers and bilayers, while for the out-of-plane modes it is very small. We investigate the electronic transport properties of a bilayer graphene flake contacted by two monolayer nanoribbons. Such a finite-size bilayer flake can be built by overlapping two semiinfinite ribbons or by depositing a monolayer flake onto an infinite nanoribbon. These two structures have a complementary behavior, that we study and analyze by means of a tight-binding method and a continuum Dirac model. We have found that for certain energy ranges and geometries, the conductance of these systems oscillates markedly between zero and the maximum value of the conductance, allowing for the design of electromechanical switches. Our understanding of the electronic transmission through bilayer flakes may provide a way to measure the interlayer hopping in bilayer graphene. The adsorption of fluorine, chlorine, bromine, and iodine diatomic molecules on graphene has been investigated using density functional theory with taking into account nonlocal correlation effects by means of vdW-DF approach. It is shown that the van derWaals interaction plays a crucial role in the formation of chemical bonding between graphene and halogen molecules, and is therefore important for a proper description of adsorption in this system. In-plane orientation of the molecules has been found to be more stable than the orientation perpendicular to the graphene layer. In the cases of F2, Br2 and I2 we also found an ionic contribution to the binding energy, slowly vanishing with distance. Analysis of the electronic structure shows that ionic interaction arises due to the charge transfer from graphene to the molecules. Furthermore, we found that the increase of impurity concentration leads to the conduction band formation in graphene due to interaction between halogen molecules. In addition, graphite intercalation by halogen molecules has been investigated. In the presence of halogen molecules the binding between graphite layers becomes significantly weaker, which is in accordance with the results of recent experiments on sonochemical exfoliation of intercalated graphite. 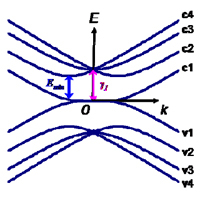 The derivation for the transport coefficients of an electron system in the presence of temperature gradient and the electric and magnetic fields are presented. The Nernst conductivity and the trans- verse thermoelectric power of the Dirac fermions in graphene under charged impurity scatterings and weak magnetic field are calculated on basis of the self-consistent Born approximation. The result is compared with so far the available experimental data. We study the conductivity of disordered zigzag graphene nanoribbons in the incoherent regime by using the Boltzmann equation approach. The band structure of zigzag nanoribbons contains two energy valleys, and each valley has an excess one-way channel. 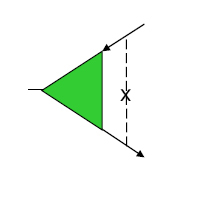 The crucial point is that the numbers of conducting channels for two propagating directions are imbalanced in each valley due to the presence of an excess one-way channel. It was pointed out that as a consequence of this imbalance, a perfectly conducting channel is stabilized in the coherent regime if intervalley scattering is absent. We show that even in the incoherent regime, the conductivity is anomalously enhanced if intervalley scattering is very weak. Particularly, in the limit of no intervalley scattering, the dimensionless conductance approaches to unity with increasing ribbon length as if there exists a perfectly conducting channel. 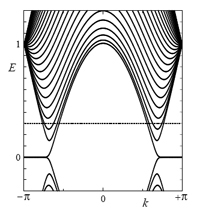 We also show that anomalous valley polarization of electron density appears in the presence of an electric field. 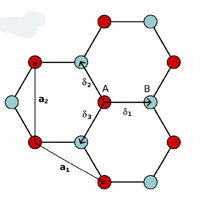 Within a minimal model, we present analytical expressions for the eigenstates and eigenvalues of carriers confined in quantum rings in monolayer and bilayer graphene. The calculations were performed in the context of the continuum model, by solving the Dirac equation for a zero width ring geometry, i.e. by freezing out the carrier radial motion. We include the effect of an external magnetic field and show the appearance of Aharonov-Bohm oscillations and of a non-zero gap in the spectrum. Our minimal model gives insight in the energy spectrum of graphene-based quantum rings and models different aspects of finite width rings. We use a tight binding approach and density functional theory calculations to study the band structure of graphene/hexagonal boron nitride bilayer system in the most stable configuration. We show that an electric field applied in the direction perpendicular to the layers significantly modifies the electronic structure of the whole system, including shifts, anticrossing and other deformations of bands, which can allow to control the value of the energy gap. It is shown that band structure of biased system may be tailored for specific requirements of nanoelectronics applications. 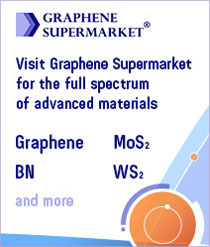 The carriers’ mobilities are expected to be higher than in the bilayer graphene devices. The Fermi energies of electrons and holes and their densities in different graphene layers (GLs) in the n- and p-regions of the electrically induced n-i-p junctions formed in multiple-GL structures are calculated both numerically and using a simplified analytical model. The reverse current associated with the injection of minority carriers through the n- and p-regions in the electrically-induced n-i-p junctions under the reverse bias is calculated as well. It is shown that in the electrically-induced n-i-p junctions with moderate numbers of GLs the reverse current can be substantially suppressed. Hence, multiple-GL structures with such n-i-p junctions can be used in different electron and optoelectron devices. We built graphene nanoflakes doped or not with C atoms in the sp3 hybridization or with Si atoms. These nanoflakes are isolated, i.e. are not connected to any object (substrate or junction). We used a modified tight binding method to compute the  and  density of states. The nanoflakes are semiconducting (due to the armchair geometry of their boundaries) when their are pure but the become conducting when doped because doping removes the degeneracy of the density of states levels. Moreover, we showed that the  Fermi level and the Fermi level of both  and  electrons are not superimposed for small isolated nanoflakes. 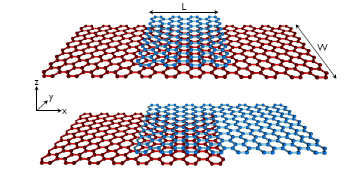 We analyze competition between different ordered states in bilayer graphene (BLG). Combining arguments based on SU(4) spin-valley flavor symmetry with a mean field analysis, we identify the lowest energy state with the anomalous Hall insulator (AHI). This state is an SU(4) singlet excitonic insulator with broken time reversal symmetry, exhibiting quantized Hall effect in the absence of external magnetic field. 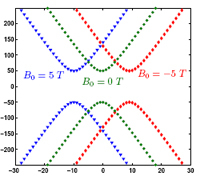 Applied electric field drives an Ising-type phase transition, restoring time reversal symmetry. 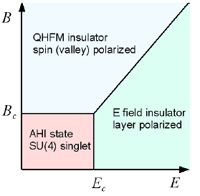 Applied magnetic field drives a transition from the AHI state to a quantum Hall ferromagnet state. We estimate energies of these states, taking full account of screening, and predict the phase diagram. Magnetic impurities in neutral graphene provide a realization of the pseudogap Kondo model, which displays a quantum phase transition between phases with screened and unscreened impurity moment. 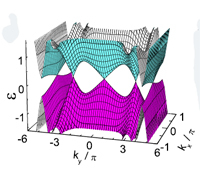 Here, we present a detailed study of the pseudogap Kondo model with finite chemical potential m. While carrier doping restores conventional Kondo screening at lowest energies, properties of the quantum critical fixed point turn out to influence the behavior over a large parameter range. 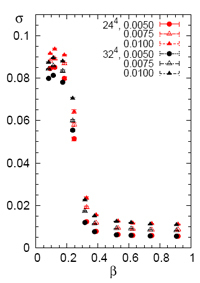 Most importantly, the Kondo temperature TK shows an extreme asymmetry between electron and hole doping. At criticality, depending on the sign of m, TK follows either the scaling prediction TK / |m| with a universal prefactor, or TK / |m|x with x  2.6. This asymmetry between electron and hole doping extends well outside the quantum critical regime and also implies a qualitative difference in the shape of the tunneling spectra for both signs of m.
The electronic structure of few-layer graphene (FLG) samples with crystalline order was investigated experimentally by infrared absorption spectroscopy for photon energies ranging from 0.2 – 1 eV. Distinct optical conductivity spectra were observed for different samples having precisely the same number of layers. The different spectra arise from the existence of two stable polytypes of FLG, namely, Bernal (AB) stacking and rhombohedral (ABC) stacking. The observed absorption features, reflecting the underlying symmetry of the two polytypes and the nature of the associated van Hone singularities, were reproduced by explicit calculations within a tight-binding model. The findings demonstrate the pronounced effect of stacking order on the electronic structure of FLG. Defects in graphene, such as vacancies or adsorbents attaching themselves to carbons, may preferentially take positions on one of its two sublattices, thus breaking the global lattice symmetry. This leads to opening a gap in the electronic spectrum. We show that such a sublattice ordering may spontaneously occur in a dilute ensemble defects, due to the long-range interaction between them mediated by electrons. As a result sublattice-ordered domains may form, with electronic properties characteristic of a two-dimensional topological insulator..
We report a first-principles study of hydrogen storage media consisting of calcium atoms and graphene-based nanostructures. We find that Ca atoms prefer to be individually adsorbed on the zigzag edge of graphene with a Ca-Ca distance of 10 Å without clustering of the Ca atoms, and up to six H2 molecules can bind to a Ca atom with a binding energy of ~0.2 eV/H2. A Ca-decorated zigzag graphene nanoribbon (ZGNR) can reach the gravimetric capacity of ~5 wt % hydrogen. 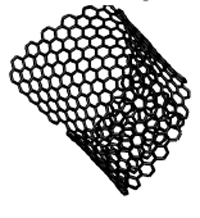 We also consider various edge geometries of the graphene for Ca dispersion. ect of these extra Dirac points on the density of states and on the conductivity is investigated. A comparison of the compact and non-compact lattice versions of the low-energy theory of graphene is presented. The compact theory is found to exhibit a chiral phase transition which appears to be of first order, at a critical coupling of c = 0.42 ± 0.01. We confirm that the noncompact theory exhibits a second-order transition at c = 0.072±0.003, and determine the effects of UV-divergent tadpole contributions in both cases. Upon tadpole improvement of the non-compact theory we find TI c = 0.163 ± 0.002, which strengthens the case for a semimetal-insulator transition in graphene at strong Coulomb coupling. Finally, we highlight the need for systematic studies using improved lattice actions. Single-layer graphene sheets are typically characterized by long-wavelength corrugations (ripples) which can be shown to be at the origin of rather strong potentials with both scalar and vector components. We present an extensive microscopic study, based on a self-consistent Kohn-Sham-Dirac density-functional method, of the carrier density distribution in the presence of these ripple-induced external elds. We nd that spatial density uctuations are essentially controlled by the scalar component, especially in nearly-neutral graphene sheets, and that in-plane atomic displacements are as important as out-of-plane ones. 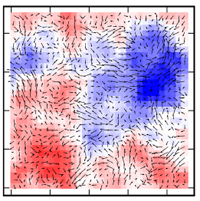 The latter fact is at the origin of a complicated spatial distribution of electron-hole puddles which has no evident correlation with the out-of-plane topographic corrugations. In the range of parameters we have explored, exchange and correlation contributions to the Kohn-Sham potential seem to play a minor role. We report on the observation of photon helicity driven currents in graphene. The directed net electric current is generated in single layer graphene by circularly polarized terahertz laser radiation at normal as well as at oblique incidence and changes its sign upon reversing the radiation helicity. The phenomenological and microscopic theories of the observed photocurrents are developed. We demonstrate that under oblique incidence the current is caused by the circular photon drag effect in the interior of graphene sheet. By contrast, the effect at normal incidence stems from the sample edges, which reduce the symmetry and result in an asymmetric scattering of carriers driven by the radiation field. Besides a photon helicity dependent current we also observe photocurrents in response to linearly polarized radiation. The microscopic mechanisms governing this effect are discussed.